David Bowie’s prolific and inventive recording career began over 50 years ago, and he achieved fame early on with the release of “Space Oddity” in 1969 (see our post from 2013). Over the decades he was called a “shape shifter” for surprising us regularly with changes in look and musical style. It is a bittersweet final chapter to his story that he passed away on the day he released “Blackstar”, with its full serving of new musical direction. We won’t have the opportunity to hear Bowie expand and expound upon this new direction in interviews or performances, so let’s make sure to do a little examination of his last work on our own. Blackstar was recorded with the backing of jazz musicians saxophonist Donny McCaslin, guitarist Ben Monder, drummer Mark Guiliana and keyboardist Jason Lindner. Bassist Tim Lefebvre was on hand as well. Bowie met McCaslin in 2014, and McCaslin, Monder and Guiliana played in the orchestra on Bowie’s 2014 single “Sue (Or in a Season of Crime)”. The track is in a straighter jazz vein than the more eclectic sounds the group created on “Blackstar”. The songs from “Blackstar” getting the most early attention are its nearly 10-minute title track and “Lazarus”. Both are the subjects of elaborate videos, the latter taking on a special meaning in light of Bowie’s passing. But the videos can frankly be a distraction from hearing the music, so let’s start with “Dollar Days” which has no video – but close your eyes for good measure. Now that you’ve practiced listening with closed eyes, listen to “Lazarus” once that way, then take the last look at one of Rock and Roll’s geniuses he apparently intended us to take. Let’s start with a VERY young talent, in case you missed the piece on “60 Minutes” last weekend. Joey Alexander is a 12-year old jazz piano prodigy who’s being mentored by no one less than Wynton Marsales. The story goes that Joey taught himself to play listening to his parents’ jazz records in his native Bali. It’s pretty obvious that his brain is wired in a special, special way. Check out this soulful studio performance of “Over the Rainbow”, a track featured on his 2015 debut album “My Favorite Things”, Grammy-nominated for Best Jazz Instrumental Album. If you’d like to hear him really cook, listen to another track from that album, Coltrane’s “Giant Steps”. The recorded version is nominated for “Best Improvised Jazz Solo”. Vienna Teng has five studio albums to her credit, a recording career that began in 2002 after this Stanford-educated computer scientist quit her day job. Her most recent album, “Aims” released in 2013, covers a lot of musical ground and reveals many influences. You can listen to and buy the tracks on her website. Vienna lists Tori Amos as one of her influences, and you can’t help but hear that on “Close to Home”. In case you need a reminder, though, listen to Tori’s performance of her exquisite “Silent All These Years” from 1992. Time for an overdue dip in the modern jazz pool. Tauk is a four-piece, instrumental fusion band from Oyster Bay, Long Island (thanks for the heads up, Charlie!). Three of the band’s four members began playing together in middle school and reunited after college. “Friction” is the first track from their new album “Collisions” (that guitar tone is very Walter Becker), and if you want an introduction to their earlier album, “Homunculus”, try out “In the Basement of the Alamo”. Fletch’s Brew is a U.K. band built around drummer Mark Fletcher, and it includes a crew of seasoned musicians who have played with pretty much everyone you’ve ever heard of from Dizzy Gillespie to Diana Ross, and from Chrissie Hynde to Placido Domingo! Despite all that history they are thoroughly modern, having raised money to record their new album “39 & 47” on KickStarter. Here is the band playing their progressive version of the jazz standard “Invitation”. Thievery Corporation is the duo of Eric Hilton and Rob Garza, who have been turning out incredible records and live shows that mix a broad range of musical styles since they teamed up in 1995 in Washington, D.C. Their shared love of Brazilian Bossa Nova apparently was part of what drew them together as artists, but “Saudade” is their first album entirely dedicated to that genre. Here are “Firelight” and “Bateau Rouge” featuring long-time vocal collaborator Lou Lou Ghelichkhani. Some famous female vocalists have new music out, and a great new singer has arrived on the scene. Rosanne Cash, eldest daughter of Johnny and superstar in her own right, released “The River and the Thread” in January. The album has received its share of good reviews, and the first track is “A Feather’s Not a Bird”. The album’s producer is Rosanne’s husband John Leventhal, who also co-wrote all the songs and plays lead guitar on this performance. If you like the video below, check out this studio performance of “The Long Way Home” with John backing Rosanne on acoustic guitar. Perhaps the best Rock & Roll frontwoman ever is Chrissie Hynde of the Pretenders. Almost 35 years after “Brass in Pocket” launched the band’s career, Chrissie is about to release her first solo album. “Stockholm” is due out in June, and the first single “Dark Sunglasses” has been released. Unfortunately, the video shows us no Chrissie, just a bunch of folks wearing – you guessed it. If you want to see Chrissie front the Pretenders in their heyday, 30 years ago, check out the other video too. The video quality isn’t great, but don’t you wish you’d been there? Back in October we wrote about Lake Street Dive covering a Jackson Five tune. The band is now out with a new full-length LP “Bad Self Portraits” that is fresh and absolutely delightful from start to finish. The band’s lead singer, Rachel Price, has a great voice and a unique style that propels the band’s range of jazz, soul and R&B tunes. Here is the title track from the new album, and “You Go Down Smooth”. Over the past few weeks the Beatles have been celebrated and remembered as the 50th anniversaries of their Ed Sullivan Show appearance and first U.S. concerts were observed. So, we’ve got to do our Beatles homage too! Thanks to Dave for turning us on to this clip from the Late Show with David Letterman featuring Broken Bells covering “And I Love Her”. The ballad is from the Fab Four’s third album “A Hard Day’s Night”. The TV set featuring Ringo Starr’s drumming is a cute idea. But wait, that TV set may be more than just a cute idea. I’m guessing that Danger Mouse and James Mercer saw this video as they planned their staging. It’s a clip from the movie “A Hard Day’s Night”. This beautiful song was covered by many, many artists over the years. Here’s an interesting cover from the late jazz legend Sarah Vaughn taped in 1969. She recorded a totally different arrangement of the song on a 1981 album of Beatles covers. If you do not have a Wordpress account, signing up for one is easy. Once registered you can click Follow to get email notices of new posts. 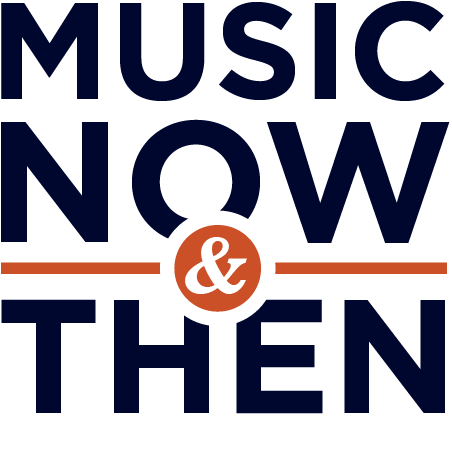 Of course you can always visit www.music-nowandthen.com.